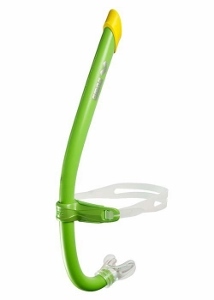 This is the snorkel for the advanced swimmer that is looking to get more of a workout during their training practices. With it's smaller tube yet hydrodinamic design, it allows more stability while swimming fast and more concentration on your swimming form. This pro snorkel from Arena has the option for multiple size tops and has 2-size silicone mouthpiece made from silicone that allows for a custom fit.